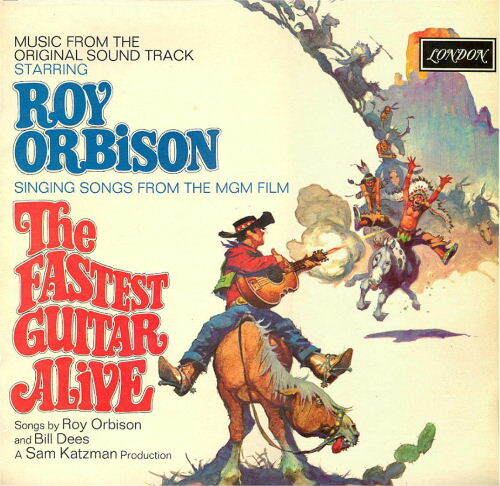 For Soundtrack of the Week #400 we turn to the great Roy Orbison and his music for the film The Fastest Guitar Alive, in which he also starred. Roy Orbison is really something. Perhaps my favorite male vocalist. Several of the songs on this record are just really good. Some of them are insanely great. The first track, for instance, "Whirlwind", is a powerful "classic" Orbison number, similar to his "Ride Away". Another great one is "Heading South", which starts out misleadingly jaunty before plunging into Roy's haunted landscape. Those are my two favorites but every song has that soaring, stirring, sensitive voice at its heart. The movie is supposed to be pretty bad but the music is excellent.